sometimes feels like a big game of whack-a-mole. and I have gotten about 300% faster at folding laundry than I was when we got married. and the next I'll be up late trimming 40 lbs of chicken to put in the freezer. something unusual comes up that knocks them out again. but it is definitely so busy. The other day I was re-reading a blog post I wrote about Wesley's blessing day. As I read those words, I was taken back to the days when Sam was gone 70-80 hours per week working, he had very demanding church responsibilities, I was trying desperately to adjust to two children, my oldest was struggling with the transition, and we were several states away from any family members. I remembered those days that were so busy in such a different way. the busyness of today feels so much easier than the busyness of those trying years. We have been meaning to bless Wesley for quite some time. We wanted to do it when Sam's mom and brother were here so his brother could stand in the circle, but it happened to be Stake Conference when they were here. So we made plans to do it the first Sunday in December. We neglected to remember to call a couple of friends in the ward to participate though, until the night before. So we decided to do it the following Sunday. That happened to be the day we took Wesley to the ER and spent a couple days in the hospital, so we finally got to bless him on Sunday, December 18. -Our car broke down the day before so we had only one car and Sam had his meetings before Church started at 8:30. So he hurriedly came home in between his meetings and Church to pick us up. -We got to Church, Sam took his place on the stand, I got a little girl to sit with the boys, and I went to play prelude music on the organ and help accompany. -Sam, who was conducting, announced Wesley's blessing and I hurried down from the organ, got Wesley, handed him to Sam, and stayed with Talmage while Wesley was blessed. -Sam then handed Wesley to me, I turned around and handed him to the woman sitting behind me, and then hurried back up to help play the Sacrament Hymn. -After the Sacrament was passed, I took Talmage and went to feed Wesley. -I got back into the chapel just before the intermediate hymn was to be sung and hurried back up to accompany that. -After playing the closing hymn, I quickly gathered up our things and Sam took Talmage to nursery while I stopped at the library to get a few supplies for Sharing Time in Primary. -The library (which isn't open before Church, so I had to go between Sacrament Meeting and Primary) was very busy and there was difficulty in finding my supplies. -Sam helped me bring the large TV, movie, and pictures down to the Primary room. -Primary had already pretty much started and I was supposed to conduct since the president was out of town. -Because of a series of events I had only 5 minutes for Sharing Time so I quickly shared an abbreviated lesson. -After Church we needed to hand out new manuals to the teachers and set up more chairs for the next ward. -Wesley was still trying to get back on track with his eating and weight after his hospital stay and weight loss, so screamed the whole time we set up chairs. -I hauled Talmage, Wesley, Wesley's carseat, Talmage's nursery handouts, my church bag, my purse, a large wooden block the Relief Society gave out for Christmas, and 2 coats to the Mother's Room to feed Wesley again. -Sam helped process tithing and then we had tithing settlement, after which I hurried to a baptism since I needed to do the Primary welcome (again, since the President was out of town). -Sam dropped off tithing at the lockbox at the bank and came back for the very end of the baptism. -The pianist had to leave after the opening song so I filled in for her. Again, Talmage and Wesley were left with friends while I played the piano. 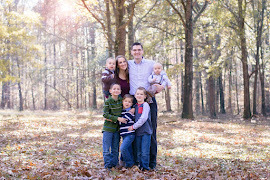 -We finally got home from Church way past Talmage's naptime, Wesley's front was completely yellowed with copious amounts of spit-up, he had blown out of his diaper all over his blessing outfit and I gave up on the family picture I had hoped for. -Talmage napped and Sam left to take the missionaries to a fireside in Sugarland, returning around 9:00 pm. On days like that I just have to laugh and wonder how--when I can barely manage things at times with two kids--I will be able to manage many more. I guess we just take things one day at a time, huh? and you will learn to enjoy the busyness of it all. that is an insane story! hahaha... Being a member of the Church is VERY different outside of Utah, is it not? There is ALOT of responsibility and covering for others ;). It can definitely be different, but I grew to love it! There is something really neat about people working so hard together to make a ward successful. Two was definitely the hardest for me! It's crazy to me how I felt like I was busy all day with one child and the day certainly hasn't gotten any longer, but I can still meet the needs of four. I think abilities grow with demand! And I'm sure there is more than a little heavenly help there, too.